In a country with over 6,000 breweries and probably somewhere in the ballpark of 258,673 different beers brewed at all those said breweries, the Venn of similarities is bound to happen. We’re just glad that in this particular case it happened amongst friends who respect how each other does business, how both have remained staunchly independent and how both can talk (and hug) and figure it out. Here’s what happened. 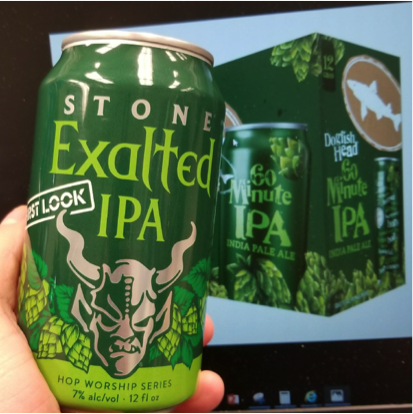 A couple weeks ago, one of our distributor partners shot us a text noting some similarities in packaging design a new beer from our pals at Stone Brewing looked compared to our 60 Minute IPA can packaging. Like our trademarks, our cans and packaging distinguish our brand from the many others on the shelf, and devoted fans and casual drinkers alike know to look for our green can and design when they’re on the hunt for a 60 Minute IPA. We agreed to reach out to our friends at Stone to allay concerns about any potential confusion the similarities might cause. But this is where the mutually supportive spirit of independent craft breweries and our collective preference for prioritizing collaboration over competition comes into play. Sam reached out to Greg, Steve and Dominic at Stone with a photo of the two packages and described Dogfish hopes that Team Stone could see where these two packages had characteristics in common that possibly maybe might cause consumer confusion. As we hoped, Greg and the leadership team at Stone were cool about it, said “Oops!" They agreed that it would be best for our collective mojo if their can packaging for the limited release Stone Exalted IPA, if and when they bring future batches of this beer to market, changes. Stone and Dogfish both understand that, in brewing and packaging, there is a point of no return per each new product launch once the cans are printed. That point had already passed for the Stone Exalted IPA. So the initial batch of Exalted IPA will hit the market with the existing packaging design but if future batches hit the market the packaging will change to help make sure our beers don’t look too similar. Team Dogfish and Team Stone look forward to sharing both of these beers with each other in Nashville at this year’s Craft Brewers Conference because things like this happen sometimes and it feels good to work through challenges amicably. Next time you’re at your local store that sells independent craft beer, pick up a Stone Exalted IPA to go along with your Dogfish Head 60 Minute IPA.